Geneva, Switzerland – In his new book 'Your brain knows more than you think', the neuroscientist Professor Niels Birbaumer, a Senior Research Fellow at the Wyss Center, in Geneva, Switzerland, investigates the limitless capacity of the brain to remould itself. Co-authored with journalist Jörg Zittlau, the popular science book investigates how the brain's plasticity allows it to overcome almost any condition. For suffers of depression, anxiety, ADHD, addiction or the after effects of stroke it gives them new found hope. Through stories of his work with patients, Birbaumer shows that even in the direst of circumstances, we can live happy lives through brainpower alone. Birbaumer knows more than most about the workings of the mind. His research is with people who, through the progressive motor neuron disease, ALS (amyotrophic lateral sclerosis), have locked-in syndrome leaving them completely paralyzed and motionless. Above is the world's first letter written using the electrical activity of the brain by a patient. In it, he invites the author and his collaborators to a party to celebrate his achievements. 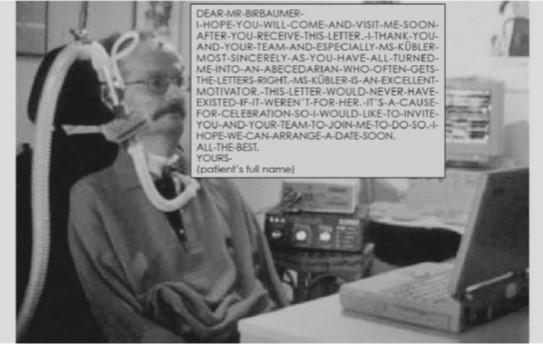 Salzmann is one of many completely locked-in patients that Birbaumer's research has enabled to communicate. Birbaumer is a pioneer in the use of brain computer interfaces for people with neurological disorders and his research encompasses the neurobiological basis of learning and behaviour. He has been awarded numerous international prizes including the Gottfried Wilhelm Leibniz Prize, the Albert Einstein World Award of Science and the Helmholtz Medal of the Berlin-Brandenburg Academy of Sciences and many other honours including honorary doctorates. Jörg Zittlau studied philosophy, biology and sports medicine. He is a freelance journalist and writes about science and psychology, amongst other topics. He is also the author of several bestsellers. Your Brain Knows More Than You Think is full of stories like Salzmann's; of Birbaumer and his research radically altering patients' lives for the better. It is published in English by Scribe UK and is available in and ebook and print. The Wyss Center is an independent, not for profit, organization that provides the expertise, facilities and financial resources to transform creative neuroscience research into clinical solutions that will improve the lives of people with nervous system disorders. The Center supports highly innovative neurotechnology projects from anywhere in the world that fit the core mission to accelerate the development of neurotechnology for human benefit and can make full use of the Center's capabilities and resources.